WHEREAS, to achieve these objectives, it is advisable that the Authority assume the powers possessed by the Board of Directors of the Public Benefit Corporation and the Department of Health during the transitional period to a new health care delivery system. The Authority hereby declares the continued existence of a state of emergency in the public health care system, including the governance, oversight and operation of D.C. General Hospital and the public clinics. During that period, the Authority shall exercise oversight and supervision of the implementation of the health care services contract with Greater Southeast Community Hospital Corporation I and the establishment of the new health care delivery system. The Authority hereby delegates to Francis S. Smith, its Executive Director, authority to exercise all the authority. powers, functions, duties, responsibilities, exemptions, and immunities of the PBC Board of Directors and the head of the District of Columbia Department of Health. The Authority hereby delegates to Francis S. Smith, its Executive Director, authority to exercise its powers under Section 5204 of Public Law 104-208. The Authority hereby designates Authority employee Dr. George Gilbert as an agent of the Authority for purposes of providing oversight and executive and operational management of D.C. General Hospital and the public clinics during the period of transition to the new health care delivery system. The Authority hereby designates the District of Columbia Department of Health as an advisor to the Authority for oversight and implementation of the health care services contract with Greater Southeast Community Hospital Corporation I and the new health care delivery system. The Authority hereby directs the District of Columbia Department of Health to issue a state plan amendment for the Medical Assistance Program (Medicaid) transferring the disproportionate share hospital allotment currently received by D.C. General Hospital to Greater Southeast Community Hospital Corporation I, effective October 1, 2001, for the purposes of providing compensation for services to uninsured District residents provided under the contract with the Authority. If any provision, section, sentence, clause, phrase, or word of this Order or the application thereof to any person or circumstance, is held invalid, the invalidity shall not affect any other provision, section, sentence, clause, phrase, word, or application of this Order which can be given effect without regard to the invalid provision, section, sentence, clause, phrase, word, or application. To this end the provisions of this Order are severable. Now, Therefore, Be It Resolved That the Mayor, Council of the District of Columbia, the PBC Board, and the District of Columbia Financial Responsibility and Management Assistance Authority shall jointly pursue a private sector alternative to the delivery of comprehensive health services currently provided by the PBC as an independent governmental entity. The contractor selected will be responsible for providing an integrated, community-based system that emphasizes primary and preventative health care and ensures that District residents who become ill receive the inpatient, diagnostic and specialty services they need. The Financial Authority will issue a Request for Proposals (RFP) by December 15, 2000 with proposals due by January 16, 2001. The UP was developed by the Financial Authority, Mayor, and Council who wilt also constitute the review committees that will select a contractor by January 24, 200 I . The contract will be approved by the Mayor and sent to the Council by February I, 2001, and a Council briefing will be held by February 8, 2001. The selected contractor will receive a letter contract by January 28, 2001, and contract operations will begin by March 13, 2001. The selected contractor will be required to provide (either directly or with a consortium of one or more subcontractors) (lie following health services, presently provided by the PBC, on a comprehensive integrated and coordinated basis: (a) primary care: (b) specialty healthcare; (c) Inpatient services, (d) emergency/urgent care; and (e) public school healthcare. Contractor selection will be based on the following criteria and weights: Up to 500 points will be awarded for the Offeror's past experience and performance on comparable contracts. knowledge and understanding of the needs of the Authority, quality of professional and management personnel assigned to support this service, the Offeror's approach and compliance with RFP requirements and ability to fulfill the scope of work. As a component of the technical evaluation, the Offerors will be given preference points for proposing to use current DC General employees as their first source of employees for any positions funded under this contract. Preference will also be given for Offerors proposing to locate services at the current DC General Hospital site. Each proposal will also be evaluated on its proposed costs. The selection will be made on a best value basis. The RFP will require bidders to provide a cap on reimbursement for District-funded services based on their itemized cost for specific services multiplied by the volume of each service presently being received by uninsured patients of the PBC. To the extent that total costs on an basis are lower than projected, the savings will be shared between the contractor and the District. To the extent volumes of services result in expenses above the contractor's total cap. District will provide additional reimbursement, at a lower rate per service, until the District's " cap on annual expenditures is reached. This cap wilt not be disclosed until after the bidding process is complete and will be consistent with the current multi-year financial plan and sec for the District of Columbia. Two additional actions protecting the health of uninsured District residents will be completed. First, within the next 30 days, the PBC will submit a plan to the Financial Authority and the Mayor for ensuring that the services it currently provides will continue (either directly delivered or through contracting) with no degradation in quality, as interim personnel reductions (Including an initial 500 required by Congressional legislation) and service efficiency improvements proceed. Second, should the RFP process not produce a successful contractor by January 24, 2001, I , the Mayor, the Council, and the Financial authority will implement an alternative plan, that provides equivalent volumes and service types to those currently provided by the PBC for uninsured (district residents, by March 13, 2001. This restructuring plan fulfills the requirements in the District of Columbia Appropriations Act, 2001, and is the precursor for the transfer of up to $90 million from other non-federal funds to the Human Services appropriation for the purpose of restructuring the delivery of health services in the District of Columbia. Adopted, this day of December 2000. 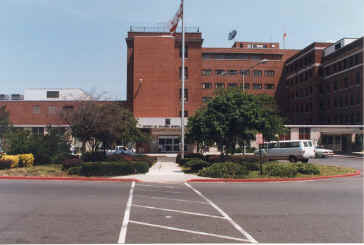 "That no appropriated amounts and no amounts from or guaranteed by the District of Columbia government (including the District of Columbia Financial Responsibility and Management Assistance Authority) may be made available to the [PBC] (through reprogramming, transfers, loans, or any other mechanism) which are not otherwise provided for under this heading until a restructuring plan for D.C. General Hospital has been approved by the Mayor-of the District of Columbia, the Council of the District of Columbia, the Authority, the Chief Financial Officer of the District of Columbia, and the Chair of the Board of Directors of the [PBC] ....'' (Pub. L. 106-522, H.R. 5633, 106th Cong., 2d Sess., pg. 17 (Nov. 22, 2000)). (3) the plan includes a certification that the plan does not request and does not rely upon any current or future request for additional appropriation of Federal funds." (Pub. L. 106-522, H.R. 5633, 106`11 Cong., 2 Sess., pg. 13 (Nov. 22, 2000)). WHEREAS, in order to be able to act to assure the uninterrupted delivery of health care services in conformity with Federal and District law, including the FY 2001 D.C. Appropriations Act, the federal Anti-deficiency Act, and federal appropriations law, the Authority must act now to preserve its options in the event that the PBC restructuring and privatization process is not successfully completed prior to the exhaustion of the PBC's subsidy. All of the above Recommendations must be enacted by the Council and approved by the Mayor within 90 calendar days of the adoption of these Recommendations and Orders by the Authority. If the Council and the Mayor fail to adopt these Recommendations, pursuant to Section 207 of Public Law 104-8, the-Authority will enact and implement them in accordance with the provisions of Section 207 after consultation with the appropriate Committees of Congress. Directs the Mayor to authorize and approve contracts, personnel actions, expenditures, regulations, and reprogramming of funds, and take any and all other actions necessary to implement an alternative publicly-financed health care delivery system, including establishing by the dates identified in Order No. 2 above, a mechanism to secure services currently provided by the PBC and implementing changes that may be required with regard to emergency medical services and transportation. Directs the CFO to identify to the Authority, the Mayor and the Council, by December 19, 2000, the funding resources and available sources needed to implement these Recommendations and Orders and the cost of the contracts necessitated by-the final restructuring and privatization process, consistent with the FY 2001 D.C. Appropriations Act, P.L. 106-522. Adopted this 4th day of December, 2000. At our November 3, 2000 retreat I expressed my concern that unless decisive action is taken soon, the Public Benefit Corporation (PBC) will run out of cash. It is with the greatest urgency that I write to you now to reiterate that concern about the need for prompt action. At its current rate of spending, PBC will exhaust its $=h_3 million FY 2001 subsidy by the middle of March 2001. If money is set aside to maintain PBC's clinics throughout the fiscal year, D.C. General Hospital will be forced to close even sooner, perhaps by as early as two months from today. In either case. I will be unable to redirect funds from any source to continue PBC operations unless a plan to restructure PBC is approved by Congress. Because as many as 60 days would be needed to make alternative care arrangements for patients who would be affected if the hospital shuts its doors, a decision on how to proceed must be made immediately. Unfortunately, our options are limited. Fiscal constraints imposed by Congress are complicated by the need to act during the postelection recess period. Under the FY 2001 appropriations act, Congress imposed conditions on any inter-appropriation transfer of funds to PBC. These conditions require the District to have an agreed upon restructuring plan for PBC that eliminates, at a minimum, 500 full time equivalent positions at .PBC; does not contemplate any additional expenditure of federal funds; and provides Congress with 10 days prior notice of any inter-appropriation transfer of funds. No such plan has yet been formulated. Congress is expected to be in recess until December 5, 2000. It is anticipated that Congress will adjourn again shortly thereafter until late January or early February 2001, past the point at which PBC's cash would be exhausted. It is therefore imperative that any plan to restructure PBC be in place for Congress to consider upon its return from recess on December 5. I also believe it would be prudent to formulate a contingency plan for closure of D.C. General Hospital in the event a plan to restructure PBC cannot be agreed upon in a timely manner. In conclusion, decisive action must be taken now to ensure adequate, continued delivery of public health care services in the District.